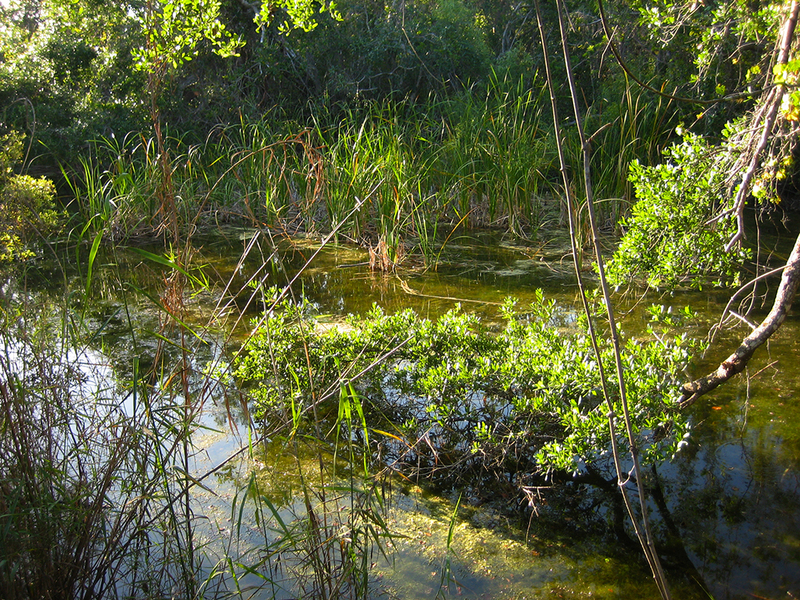 Gumbo Limbo Trail | Florida Hikes! At Royal Palm Hammock, also home of the Anhinga Trail, the Gumbo Limbo Trail is a paved path that gets you up close and personal with a tropical hammock. This was once called Paradise Key, owned by Henry Flagler, and became a state park in the 1940s prior to the creation of Everglades National Park. Although the Gumbo Limbo Trail is a short walk, it has some interesting highlights, including deep solution holes. From the Ernest Coe Visitor Center, follow the Main Park Road for 1.6 miles to the turnoff to Royal Palm Hammock. Turn left and follow this road for 1.9 miles to where it ends in the parking area. The trail starts at the “Gumbo Limbo Trail” sign next to a royal palm just outside the visitor center. Peeling gumbo-limbo trees show off their odd green and red bark, leaning heavily across the trail and clipped off in places. You tunnel into a tropical hammock, where interpretive signs explain some of the unusual residents, like pigeon plum. An overlook lets you peer into a solution hole, where bright water spangles float on the dark water. These holes form by the gradual erosion of the limestone bedrock by acidic water as rain flows through the leaves on the forest floor. There are several at different points along the trail. One of my earliest childhood memories was my dad trying to scare me on this trail by saying “ooo-lite” in a scary voice. The oolite is oolitic limestone, a sedimentary rock full of Swiss-cheese like holes that allow the water to pass through and keep dissolving it, hence a solution hole. Scarier is the poisonwood, a native Everglades tree with sap ten times more harmful than poison ivy. Don’t touch! The nasty-looking oozy dark blotches on the smooth tree trunk are the best way of identifying this tree. The trail crosses a short boardwalk over a broad solution hole that holds a small marsh. Cattails grow along the edge. As the trail ends, you emerge from the woods facing the visitor center, adjacent to the parking area.